Beispiel: I work. I don’t work. Do I work? Beispiel: She jumps. She doesn’t jump. Does she jump? Beispiel: I am working. I am not working. Am I working? Beispiel: She is jumping. She isn’t jumping. Is she jumping? Beispiel: I worked. I didn’t work. Did I work? Beispiel: She jumped. She didn’t jump. Did she jump? Beispiel: I was working. I wasn’t working. Was I working? Beispiel: She was jumping. She wasn’t jumping. Was she jumping? Beispiel: I have worked. I haven’t worked. Have I worked? Beispiel: She has jumped. She hasn’t jumped. Has she jumped? Beispiel: I have been working. I haven’t been working. Have I been working? Beispiel: She has been jumping. She hasn’t been jumping. Has she been jumping? 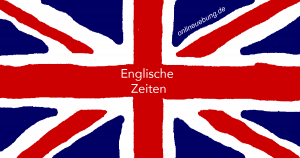 Simple Past Perfect – Vor der Vergangenheit. Beispiel: I had worked. I hadn’t worked. Had I worked? Beispiel: She had jumped. She hadn’t jumped. Had she jumped? Past Perfect Progressive – Verlaufsform der Vorvergangenheit. Beispiel: I had been working. I hadn’t been working. Had I been working? Beispiel: She had been jumping. She hadn’t been jumping. Had she been jumping? Future I Simple (will future) – Zukunft; nicht beeinflussbar. Beispiel: I will work. I won’t work. Will I work? Beispiel: She will jump. She won’t jump. Will she jump? 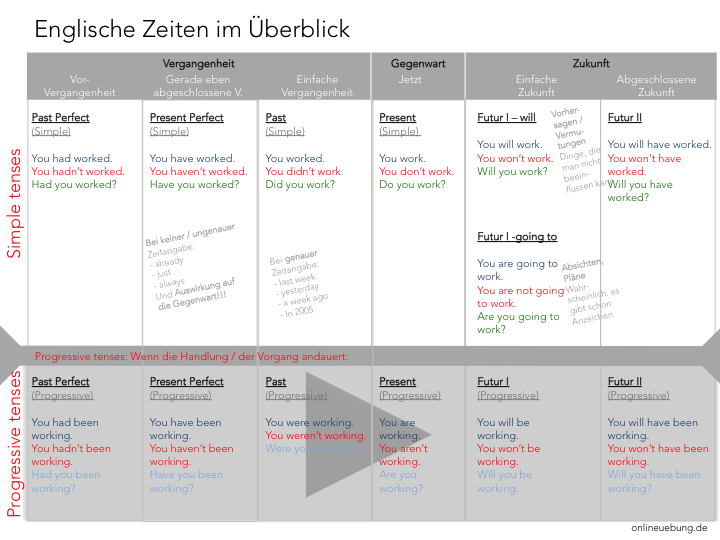 Future I Simple (going to future) – Zukunft; beabsichtigt. Beispiel: I am going to work. I am not going to work. Am I going to work? Beispiel: She is going to jump. She is not going to jump. Is she going to jump? Futur I Progressive – Verlaufsform der Zukunft. Beispiel: I will be working. I won’t be working. Will I be working? Beispiel: She will be jumping. She won’t be jumping. Will she be jumping? Futur II (Perfect) Simple – Vollendete Zukunft. Beispiel: I will have worked. I won’t have worked. Will I have worked? Beispiel: She will have jumped. She won’t have jumped. Will she have jumped? Futur II (Perfect) Progressive / Continous – Verlaufsform der vollendeten Zukunft. Beispiel: I will have been working. I won’t have been working. Will I have been working? Beispiel: She will have been jumping. She won’t have been jumping. Will she have been jumping? Verwendung: Wenn es um eine Bedingung geht und die Bedingung noch erfüllbar / möglich ist. Beispiel: If it is monday, I will work. I won’t work, if it is sunday. Will I work, if it is saturday? Beispiel: If it is not too high, she can jump. If it is too high, she might not jump. If it is that high, will she jump? Beispiel: If the shop is closed, go to another one. Conditional Typ II Simple – ‚Was wäre, wenn…‘. Verwendung: Wenn es um eine Bedingung geht und die Bedingung noch erfüllbar / möglich, allerdings unwahrscheinlich ist. if the wall was low? Conditional Typ III Simple – ‚Was wäre gewesen, wenn …‘. Verwendung: Wenn es um eine Bedingung geht und die Bedingung nicht mehr erfüllbar / möglich ist.